Why Is This Fortnite Cube Moving? Is It Leading Players to Season 6? Things keep getting stranger and stranger in the world of Fortnite. First, the rift in the sky began to close, then it started shooting lightning. Said lightning wiped out the desert’s cacti, and now a cube formed where the cacti used to grow. The latest twist is, Fortnite‘s mysterious cube is moving. 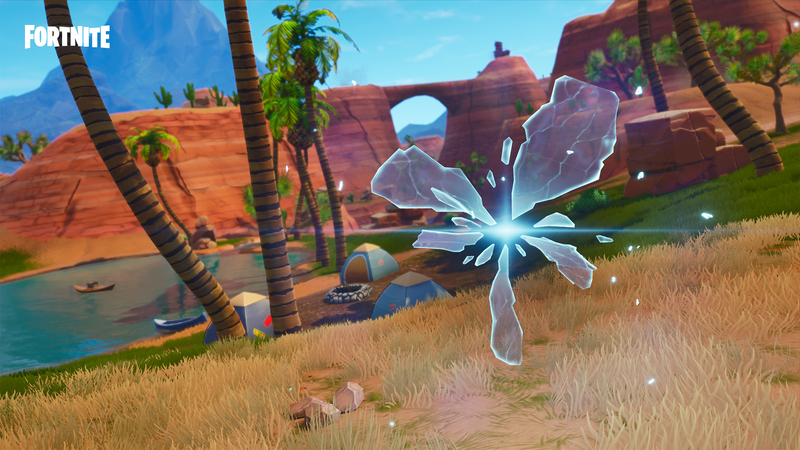 While this strange activity began in the desert, it looks like that will not be the resting place for this Fortnite mystery. FortniteBR has put out a map showing the cube’s path as of 6 pm CT on August 27, 2018, but where it will stop is anyone’s guess. Initially, people thought this moving cube might stop in the Salty Springs area of Fortnite‘s map, but seems unlikely now. It appears to be headed towards Fatal Fields. While its final destination is one mystery, another is what will happen once it stops. The cube has strange symbols written on it, but players haven’t gotten a great look at them yet. Those who get too close are sent flying away by an unknown force. The moving cube is shaping up to be one of Fortnite‘s strangest gimmicks. What does this all mean? It seems likely we will all find out when Season 6 is about to begin.